Scott represents clients facing significant business risk and high exposure litigation including product liability claims, commercial litigation, FELA and the defense of wrongful discharge and discrimination actions. He leverages his firsthand insight and business acumen to provide practical advice that puts each client’s business goals front and center. Over the years, he has gained first chair jury trial experience, participated in high-exposure personal injury and wrongful death claims, and represented clients in multiple bench trial and evidentiary hearings. Scott’s experience includes multi-week trials of high exposure personal injury and wrongful death claims. 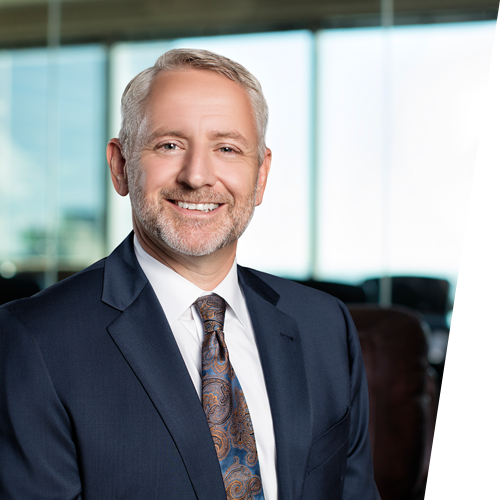 Scott has acted as national counsel in the investigation and defense of claims involving fires, vehicular and equipment accidents, product failures and other events resulting in personal injuries and property damage. Likewise, Scott has successfully litigated commercial disputes involving mergers and acquisitions, lending transactions, trade secrets, and insurance coverage. Participated in numerous origin and cause investigations arising out of fires that resulted in millions of dollars in damage, catastrophic injuries and deaths. Actively managed fire scene and laboratory inspections. Assembled teams of investigators with varying expertise depending on the particular needs of each scene and laboratory investigation. Compelled those in charge of fire scenes and artifacts to comply with industry guidelines for fire and explosion investigations in order to prevent spoliation of evidence. Litigation has rarely been brought against the firm’s clients following these investigations. Defended manufacturer’s transportation department and driver in personal injury and death claims arising out of collision on an interstate between tractor trailer and minivan. The representation included the trial of minor child’s claims for traumatic brain injury (TBI) resulting in significant permanent injury. Obtained voluntary dismissal after disclosure of experts in Texas product liability action arising from a house fire. Plaintiff’s expert admitted his opinion – that the cause of the fire was the client’s component part – was unsupported by the evidence. Represented recreational boat component part manufacturer in wrongful death action tried out of state which arose from carbon monoxide poisonings allegedly caused by defects in design in which jury was asked to award over $200 million. Achieved a unanimous defense verdict for manufacturer of exercise equipment in action involving allegations of design and manufacturing defects alleged to have caused the fire. Defended product liability cases involving battery technologies such as lithium-ion, lead-acid and nickel–cadmium (NiCd) in which products were alleged causes of fires and acid burns. Achieved dismissal of tractor manufacturer in wrongful death claims allegedly caused by failure of equipment to include roll over protection system (ROPS). Defended railroad contractor following crush injury and traumatic amputation of outside truck driver’s fingers when a freight container fell on him at the intermodal rail yard. Extensive experience in product liability cases involving toxic exposures to acids, benzene, asbestos, carbon monoxide, heavy metals and other chemicals. Recovered nearly all amounts claimed in breach of contract claim arising out of an asset sale in which the buyer failed to pay the agreed purchase price for the assets of a chemical manufacturer. Obtained summary judgment in contract dispute between retail business owners arising out of a terminable-at-will royalty agreement. Obtained temporary restraining order in Alabama on behalf of chemical manufacturer and against key employee of distributor who had taken a position with competitor. Resolved the litigation by agreement to prevent misappropriation of manufacturer’s trade secrets. Took over defense of insurer after the close of discovery in commercial litigation brought by finance company, and obtained a successful outcome during trial. Defended manufacturer in Wisconsin case involving complicated fire origin and cause issues, a significant brain injury claim, and a dispute over successor liability with a co-defendant which had acquired certain assets from the manufacturer before the fire. In claims exceeding $20 million arising out of a fire in New England which consumed a manufacturing and warehouse facility, successfully defended allegations the fire was caused by the spontaneous combustion of components sold by the firm’s client.